Before Columbus was established, the land east of the Scioto was mostly uninhabited and heavily forested. There were several Indian Mounds in the area. The area was designated as part of the Refugee Tract which was land set aside for residents of Nova Scotia that supported the American Revolution. However, when the Revolutionary War came to an end, they found themselves on the short end of the stick when the new American government gave up any claim to Nova Scotia and left it for the British. In an effort to make things right, the federal government gave these families land in the Ohio Territory. However, most of them decided not to make the treacherous move to the Ohio frontier and opted instead to sell their land rights to land speculators. 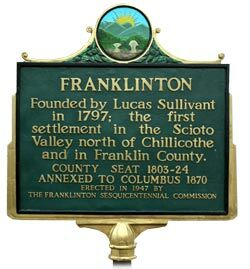 That is the reason Lucas Sullivant established Franklinton on the west side of the Scioto, as this land was available for purchase, even though it was clear the Scioto frequently flooded the area with devastating results. The frequent flooding of the area also created superior top soil for growing corn. Lucas Sullivant, who was by trade a surveyor. He had ventured several times in the previous 5 years into Ohio along the Scioto River, but not until 1795 did he get as far north as Central Ohio. On that trip Sullivant brought a group of 20 men, mules, horses and supplies up along the Scioto River from Kentucky. His job: survey the western side of the Scioto River near the confluence of the Whetstone River (now called the Olentangy). Risking encounters with Native Americans that regularly passed through the area, Sullivant completed his task, they returned to Kentucky. In payment for his work and leadership, Sullivant was given several thousand acres at the confluence. 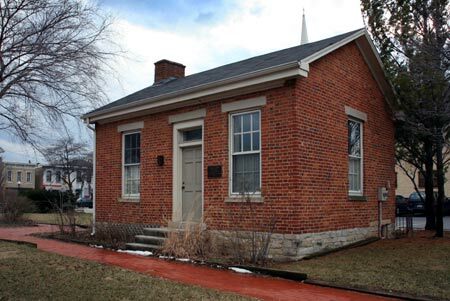 He returned to the area in August of 1797 and began the task of laying out a small town. At that time the Scioto River was a much deeper river than it is today. Today we see a river that only seems to flow when there are heavy rains. It's hard to imagine the Scioto River as being anything more than the docile river it is today. When Sullivant came to the area, it was well before the 2 large dams north of the downtown had been built for drinking water reservoirs. Those dams greatly reduced the river's water flow and cut down the amount of flooding. But in Sullivant's day, the river was a much wilder beast that would often rise up from its banks when heavy rains persisted. The town was laid out in blocks of 4 lots each. Each lot measured 99' wide by 115' deep and each lot abutted in the back with the next street's lots. There is no doubt that Lucas Sullivant was a brave and enterprising man that used his wits to survive on the frontier. He was a man of force and courage. 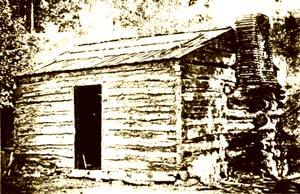 Before he brought his wife Sarah Starling up from Kentucky, he built the first brick house in the county for her. He also built a church for her to worship in, so that she wouldn't feel so home sick.